MANILA - Even up to his foreseen abdication in April 2019, Japanese Emperor Akihito, who turned 84 on Saturday, continues to win admiration from former Philippine President Benigno Aquino III, with whom he had quite a few direct interactions in the past. In a statement issued recently to Kyodo News, Aquino said:"In a world where there are those who try to cling to power, Their Majesties serve as an outstanding example of the reverse, having dedicated their whole lives to solely serving their people." "So much so that even the request to abdicate arises from that very perspective," he added. The emperor, who took over the throne after the death of his father Hirohito, posthumously known as Emperor Showa, in 1989, expressed last year his wish to retire, saying he is concerned his age would one day stop him from fulfilling his duties. Early this month, the Japanese government formally approved his abdication on April 30, 2019. Crown Prince Naruhito is set to ascend the throne the following day. "As I have stated in the past, I am held in awe, recognizing the burdens that they have borne, as they have had to live with the weight of the decisions made by others," Aquino said of the Imperial couple whose reign came decades after Japan forcibly occupied the Philippines while waging war mainly against the United States. Aquino first met then Crown Prince Akihito in 1986 while accompanying his mother, then President Corazon Aquino, on her first trip as Philippine leader to Japan. In a June 2015 speech, Aquino recalled how Emperor Hirohito "deigned to converse with an obscure citizen like myself" during that visit. "I was struck by the simplicity and sincerity of his tone as he reminded me to take care of my mother -- something that my own father had told me when I was about 13 years old, in what we thought was the last time we would ever speak," recounted Aquino, whose father, the late Sen. Benigno "Ninoy" Aquino Jr., the most vocal critic of the repressive Marcos regime, was first incarcerated for several years before he was assassinated in 1983. 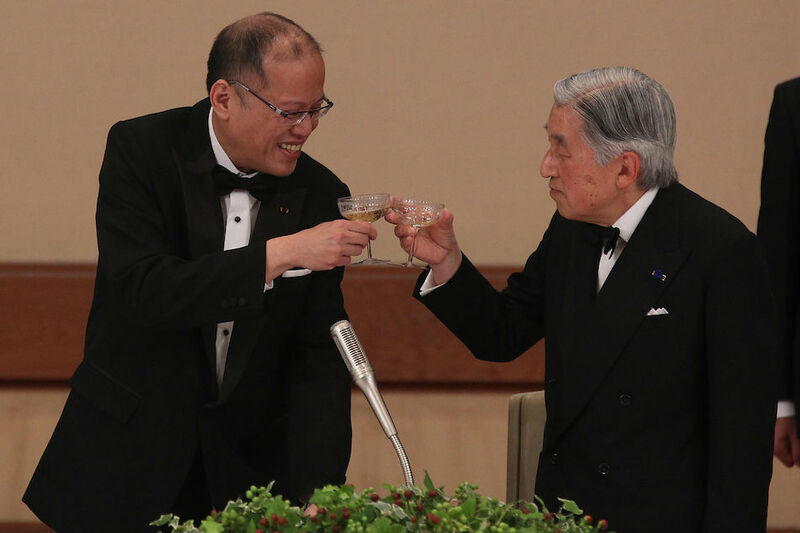 "On that occasion, the late Emperor Showa spoke a truism in telling me to care for my parents, but his warmth made me feel as if I were not a stranger," Aquino said. "This was the first and only meeting we would ever have, and yet, the memories of our trip to Japan have stayed with me all these years," he added. In much earlier remarks, Aquino said his mother, who succumbed to cancer in 2009, "struck a wonderful friendship with Emperor Hirohito." In February 1989, Aquino returned to Japan to join his mother in attending the funeral of Emperor Showa. He was also present at Emperor Akihito's enthronement in November 1990. As President from 2010 to 2016, Aquino met with the emperor in September 2011 and June 2015 in Japan, and in January 2016 in Manila. During the June 2015 visit in Tokyo, Aquino was conferred the Supreme Order of the Chrysanthemum by Emperor Akihito. Established in 1876, it is considered as Japan's highest order and is generally conferred on members of the imperial family and foreign heads of state. Aquino is the fifth Philippine President to be conferred the order. "In all my interactions with Their Majesties, I have seen in them the kind of gentleness and affection that inspires and makes one reflect," Aquino wrote in his recent statement. "One cannot help but be taken by the simplicity and dignity that Their Majesties exude." In 1962, representing his father, then Crown Prince Akihito and Princess Michiko embarked on a five-day day visit to the Philippines amid relatively still fresh memories of atrocities committed by Japanese forces during the wartime occupation. But their apprehension then on how Filipinos would welcome them turned out to be unfounded as they were met with "warm smiles" from then Philippine President Diosdado Macapagal and his wife, as well as from ordinary Filipinos. The Imperial couple returned to the Philippines in January last year for a five-day visit, marking the 60th anniversary of Philippine-Japan diplomatic relations. "It is our deepest hope that our visit will contribute to deepen the mutual understanding and friendly relations between the peoples of our two countries," the emperor said at the time.